Taught by Eric Bass and Shoshana Bass, this workshop takes participants through the process of gathering community stories through a story circle exercise, developed by John O’Neal in the Free Southern Theater during the civil rights movement. The stories we tell will become the material for exploring the potential of puppets to embody these stories and the choices we have to give the stories voice. The focus of the workshop addresses how we can tell the story of someone else without “playing” that role, and without appropriating that culture. So the process looks at song, at the actor/puppet relationship, and at simultaneous scenes, among other techniques, to explore what makes the puppet a special medium for evoking testimony. Participants will work with Sandglass’ exercise puppets from day one, and with any objects or raw materials that seem appropriate on day two. Wear comfortable clothing in which you can move. There are no materials fees for this workshop and no pre-requisite skills necessary. A crankie is an old storytelling art form that has recently become hot again. A long illustrated scroll is wound around two spools and set into a box with a viewing window. The scroll is hand cranked, the unfolding story narrated, sung or just accompanied by music. Participants will build their own crankie and create their own story. If you love to express yourself in a beautiful and pure way without technical bells and whistles the crankie will be your best and loving friend. HERE is a video of a crankie in action. This workshop is geared for participants of all levels of experience, ages 18-85. A design workshop given by Eric Bass which, from the perspective of creating a puppet, defines the differences between the actor and actor’s theater. In a three-hour class, students will explore lecture, discussion, demonstration, and their own drawings; and the reasons for and advantages of using puppets in theater. Emphasis is placed upon the use and understanding of metaphor as a theatrical device. This workshop may be expanded into one in which actual puppets are made. This might be done in a week’s workshop, under the right conditions. Recommended for high school and college students. Maximum 20 students per workshop. 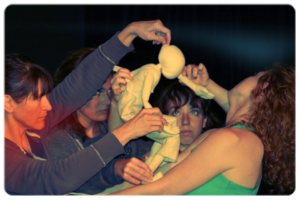 A performing workshop conducted by Eric Bass in which actors’ training techniques are carried over into the puppet, and then differentiated from the way in which an actor would use them. Emphasis is placed upon breathing disciplines and improvisation. The class will use puppets especially designed for the original exercises in which they will participate. This class may be taken in a three-hour lecture-demonstration form, a one-week intensive, or a longer (two- to four-week) version. E-mail Sandglass Theater or Call (802) 387-4051 for more information.